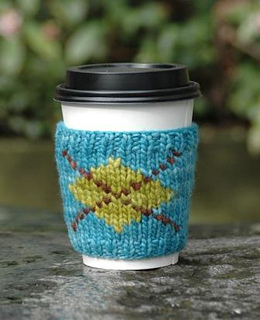 This argyle coffee cup cozy lets you use up your precious scraps of Malabrigo and enjoy your favorite hot drink in style. The S/M size fits most 8- and 12-oz. 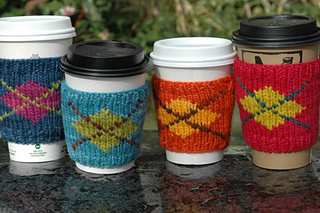 cups; the M/L size works best for 16-oz. and larger cups. The smaller size uses less than 20 yards of the main color, less than 5 yards of one contrasting color, and just over a yard of a third color. The larger size uses the same amount of the contrasting colors and about 22 yards of the main color. 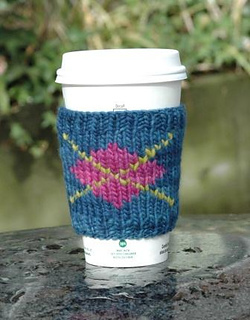 This is an easy intarsia pattern, suitable for newcomers to this technique. 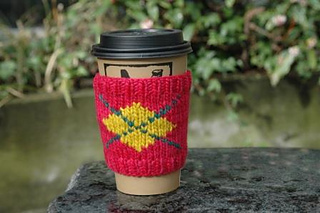 The pattern does not include instructions on the technique, but there are many video and written instructions for intarsia available on the internet.